Daily Illuminator: It's Mythically Delicious! December 26, 2011: It's Mythically Delicious! 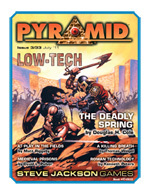 As every long-time GURPS fan knows, the next-to-last Thursday of the month marks the release of the new Pyramid. That's why we're happy to announce that we've just uploaded the latest . . . Wait. According to my notes, I'm seven days late. 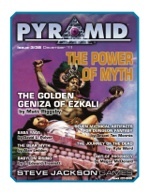 Pyramid #3/38: The Power of Myth came out last week. I even made reference to it a week ago -- and I had a pithy note then that it was a week early! The awesome might of this mythical mag obviously addled my mortal brain. For all you classic crypt crawlers, the biggest holiday surprise in this installment is not one, but two articles for Dungeon Fantasy. "The Golden Geniza of Ezkali" looks at a topic of interest to those unearthing the power of ancient stories (mythematicians?) and uses that lore to build a series of four sinister traps that guard an incredible treasure. Written by Matt Riggsby (author of GURPS Dungeon Fantasy 13: Loadouts), this adventure also includes full-color maps. If the heroes escape alive, they can go questing for any of "Seven Mythical Artifacts for Dungeon Fantasy" -- an article that delivers exactly what it promises, in the style of GURPS Dungeon Fantasy 6: 40 Artifacts. For a different take on a classic legend, GURPS giant David Pulver scares up a new take on Baba Yaga and her legendary hut. I'm not going to give anything away there, but it features GURPS Spaceships stats. In addition to a new modern-day campaign featuring the return of the Babylonian gods, this month features insightful articles that deal with classic elements of myth, including death, fortune-telling, and -- of course -- bears. The latest volume of Pyramid has been going strong for over three years now. If you picked up a 12-issue subscription a year ago, you've received cutting-edge GURPS goodness about magic, psionics, spaceships, GURPS Monster Hunters, Dungeon Fantasy, low-tech, alternate GURPS, and much more. If Pyramid #3/38: The Power of Myth sounds interesting -- and the entirety of human history indicates it should -- then consider subscribing today; you'll save some money while marveling in what new legends we're forging. I like to think I'm delivering lore like Icarus . . . even if my wife is quick to note I'm nowhere near as hot!